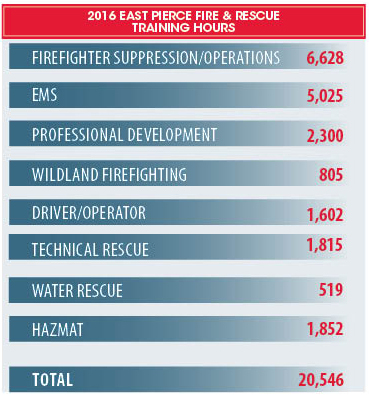 EAST PIERCE FIREFIGHTERS MAINTAIN AND IMPROVE skills and abilities through on-going training overseen by the Training Division. All career and volunteer personnel must undergo annual firefighting and emergency medical classes and drills. Training and education is crucial in keeping critical firefighting and medical skills current. In addition to the more commonly used skills, firefighters must continually update and practice special skills, such as extrication maneuvers used to remove patients trapped in their vehicles following a car accident; rope rescue often used to retrieve a patient who has fallen over an embankment; wildland firefighting; trench rescue techniques and surface and underwater rescue. The Training Division is responsible for assessing training needs, developing a training calendar and curriculum, providing instruction and record keeping. It also conducts evaluations of probationary personnel and crew-based training drills. This Division conducts on-duty training for personnel and provides instructors and specialized classes for Officer Development, Incident Command, Tactical Operations and Emergency Medical Services (EMS). Training provides an opportunity to upgrade skills and keep informed of new regulations. It allows firefighters to become familiar with equipment and maintain proficiency in critical, but sometimes seldom used firefighting and rescue skills. Assuring that all East Pierce career and volunteer firefighters meet mandatory training requirements is vital for the well-being and safety of our personnel and successful fire operations.